Plan view of the Windfall deposit. QUEBEC – Osisko Mining of Montreal has drilled yet another gold discovery at its Windfall Lake project 100 km east of Lebel-sur-Quevillon. 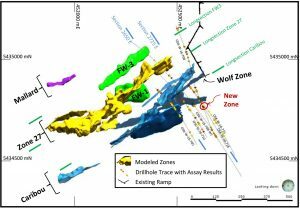 Dubbed Lynx 4, the new discovery in the Lynx Corridor returned 11.7 g/t gold (uncut) over 7.7 metres, including 85.9 g/t over 0.3 metres from hole 17-816. Visible gold grains were associated with pyrite clusters in the core. Hole 17-834 returned 421 g/t gold (uncut) over 3.7 metres or 27.8 g/t (cut to 100 g/t) over 3.7 metres, including 100 g/t over 0.4 metre from Lynx 2. Metallurgical testing of samples from Windfall has begun, and Osisko plans to dewater the ramp as soon as it receives approval of its water treatment system. Construction could begin in 2019. The deposit contains 2.76 million indicated tonnes grading 8.42 g/t gold and 3.51 million inferred tonnes at 7.62 g/t. Complete details about the Windfall gold project – maps, cross-sections, and drilling results – are available at www.OsiskoMining.com.